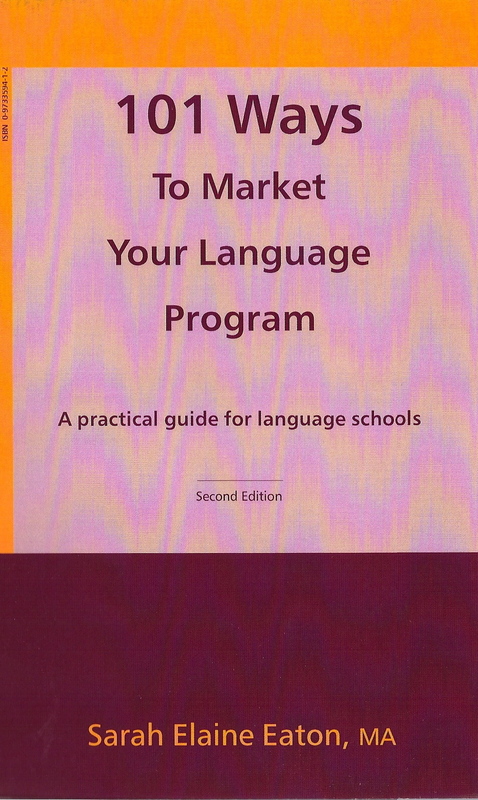 101 Ways to Market Your Language Program: A practical guide for language schools, 2nd ed. Get the premiere book for marketing of language programs that spent 5 weeks on DeMille’s Technical Books Top 10 Best sellers list, reaching #1 along the way. A practical, easy-to-read book for owners, principals and managers of language schools. The ideas offered are low-cost, creative and innovative. Topics include: assessing what you offer, developing a marketing strategey, writing effective marketing materials, creating an outstanding web page and much more. Get your copy direct from www.onatepress.com. Note that this book is no longer available on Amazon. Click to get the first chapter free! “I had confidence in this author as soon as I read the introduction. Sarah recognizes the realities faced by many language programs. The ideas are straightforward and usable in the situations we operate in. There are 101 practical ideas to try. Everyone will be able to find ideas that will promote the health and growth of their language programs. This is a great book of ideas. The ideas are organized so that it is easy for readers to pick and choose what is applicable and practical for their particular programs.